ITIL® is a globally recognised best practice methodology for IT service management that is used all over the world by leading organisations. ITIL® ensures that their IT services are aligned to the needs of their business. ITIL® provides trusted guidance on how businesses can use their IT services to support their goals and facilitate business growth. ITIL® is backed by an official range of certifications that provide knowledge of service management best practice and guidance on how to apply this knowledge across the IT service lifecycle. The range of certifications starts with ITIL® Foundation, which provides entry-level knowledge of the principles of ITIL®, and progress to ITIL® Expert, further demonstrating knowledge of the whole IT service lifecycle. 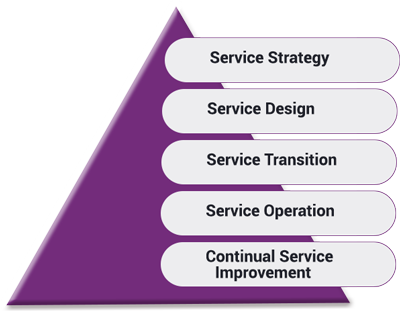 ITIL® is Structured into five core publications, that revolve around the service lifecycle. These provide best practice guidance for an integrated approach to IT service management. Understand how to make strategies of IT Service Lifecycle. It determines what services the IT organisation should offer and what capabilities are needed to be developed. The aim of Service Strategy is to make the organisations think and act in a strategic manner. Effectively design new IT services. It includes designing new services and changing and improving the existing ones. Build and implement IT services. It ensures that changes to services and service management processes are carried out in an organised way. Effective and efficient delivery of IT services. It includes fulfilling customer requests, resolving service disappointments, fixing problems, and carrying out routine operational tasks. Continually improve the quality of IT services in line with the concept of continual service improvement, adopted in ISO 20000. Service Support was the practice of those disciplines that enabled IT Services to be provided effectively. Service Delivery covered the management of the IT services themselves. It involved a number of management practices to ensure that IT services were actually provided as agreed between the Service Provider and the Customer. Each of these two areas contained a number of disciplines, which stipulated the ITIL® practices/requirements.